Kiri doesn’t belong with the wallers (city dwellers) or the fugees. She sees that even more fully when the fugees catch a leatherback turtle thought to be extinct. Kiri runs to her father, a waller, hoping he can help save the turtle. Sadly, he fails and offends the fugees, causing the fugees to ban Kiri and her father from the village. Her father responds by setting up an electric fence surrounding the swamp, making the fugees even angrier. So when Kiri discovers a panther, the fight escalates between her father and the fugees. Who will win? And will the panther survive? 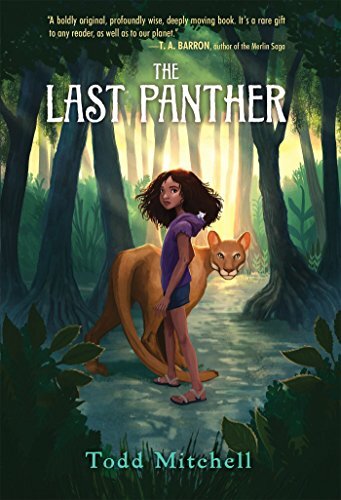 The Last Panther is an adventurous book taking place in the future where many animals are extinct or thought to be extinct. In this setting, a story of love, hurt, and courage begins. Todd Mitchell has created an easy-to-read book that draws readers into its intricate plot. Between promises, hopes, and tears, Kiri and her friends will touch readers’ hearts in a way both bitter and sweet. You will never be the same. There is some talk of devil and gods.